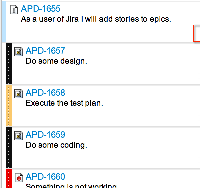 [JSWSERVER-8773] As a user of Greenhopper I will see aggregated remaining estimates in Stories on my Work board. - Create and track feature requests for Atlassian products. As a user of Greenhopper I will see aggregated remaining estimates in Stories on my Work board. See the attached screen. It would be nice to have the sub-task remaining estimates aggregated with the story remaining estimates in the card view of the work board (same way as it aggregates in issue detail view). Right now, we estimate hours for sub-tasks, rather than stories, and rollup the hours from the sub-tasks to the stories.